The demand for retro themed products is soaring and nowadays it is rare to walk into your local shop and not find something inspired from a recent era. With the rebirth of vinyl sparking an interest in all things old, other products have followed suit including the polaroid camera, the typewriter and even retro themed food and fashion! We are more globally connected than ever before, and consumers are wanting to detox from their digital devices to reduce stress. Vintage products are back in demand as people long for uncomplicated things in an increasingly complex world. This demand is likely to have stemmed from a sense of nostalgia for the stories our parents told us growing up and also a modern hit back at disposable and purposely obsolete products (Contiki, 2018). We have a fantastic range of jigsaw puzzles that hint at this retro trend. From nostalgic scenes to themed montages, our puzzles are sure to take you on a trip down memory lane! Vintage Fashion and Pop Culture are new 1000 piece puzzles that have been designed by renowned British designer, Wayne Hemingway. The imagery for these puzzles has been sourced from the Land of Lost Content, an independent museum containing Britain’s foremost collection of pop culture ephemera, obscure objects and ordinary things from the pre digital era. Belonging to eccentric artist and compulsive obsessive collector Stella Mitchell and collectors of design history, the Hemingway family, the Land of Lost Content is used as Hemingway Design’s personal design archive. “We have been collecting for decades, since our days selling second-hand on Camden Market at the turn of the 80s when everything that was cool, quirky and original didn’t make the stalls but was squirrelled away in our sheds. All that hoarding has given us one of the world’s greatest archive of design inspiration and by re-interpreting our Land of Lost Content collection we can keep great historical design alive for an increasingly design aware public” says Hemmingway. Sit down with a cup of tea and enjoy piecing together the familiar and surprising places, past-times and fashion trends found in these wonderful commemorative jigsaw puzzles. We are proud to distribute Piatnik Unique Singles playing cards. These niche themed playing cards are sourced by Bird Playing Cards, founded 25 years ago by Nicky Bird, for many years the publisher at the V&A. The range covers art, history, popular culture - and nostalgia. “We try and think up titles that will appeal to collectors of ephemera as well as those that enjoy a game of cards” says Nicki Bird. 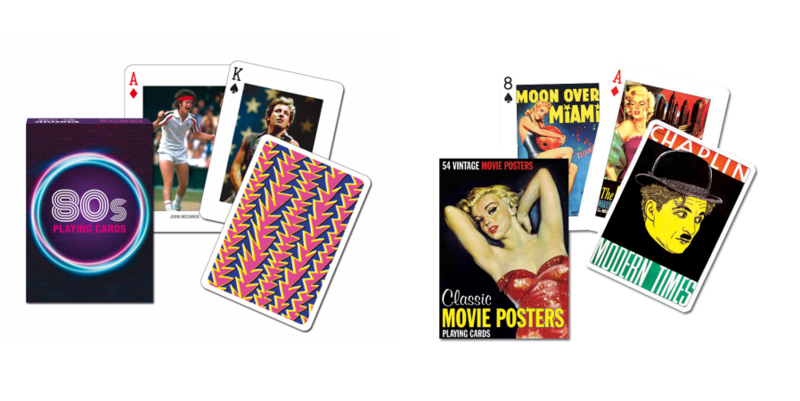 Enjoy a game of cards whilst being reminded of the bold and brash personalities of the 80s or immerse yourself in the stylish, witty and tacky Classic Movie Posters of the 40s and 50s. Piatnik’s superior standard makes these playing cards a favourite in the market, and the single packs with unique, classic and historic designs on each card are ideal for collectors and gifts. Finally, we stock a range of puzzles designed by Robert Opie. He saw the need to record the history of everyday products around us and built up the collection that now extends to all aspects of daily life - toys, magazines, technology, travel, souvenirs, fashion and design. His collection can now be viewed at The Museum of Brands, Packaging and Advertising. From our bestselling puzzle, The Brands that Built Britain, which features some of our favourite brands that are still around today including OXO and Marmite, to a collection of Sweet Memories Tins which are the winner of the Commemorative and Collectable Gift of the Year Award 2019, there is a Opie puzzle to suit everyone’s interests whether this be retro sweets or 1980s culture.